On Thursday October 22 at 7:00 p.m. the American Conservation Film Festival will have a special free sneak preview night with two films and their filmmakers. At 7:00pm filmmaker Peter Schriemer will present the family-friendly film All Over the Map: I Dream of Seney (20mins.) 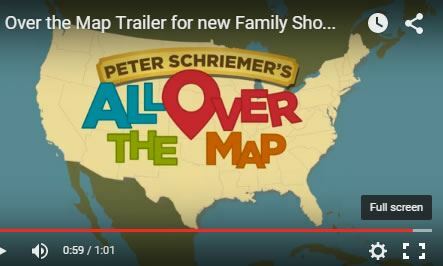 America's Nature Guy, Peter Schriemer, reconnects families with nature in this fun travel show exploring our Wildlife Refuges. In this episode, Peter takes viewers through Seney National Wildlife Refuge in the north woods of Michigan - featuring loons, frogs, beetles, snakes, and the return of the Trumpeter Swan. Friends of NCTC is proud to sponsor All Over the Map: I Dream of Seney. Attendees of our Annual Meeting have previewed the the pilot and have shared wonderful feedback! At 7:40pm filmmaker Mark Dixon and Rachel Carson scholar Patty Demarco will present The Power of One Voice: A 50 Year Perspective on the Life of Rachel Carson (52 mins.). Rachel Carson is widely regarded as one of the 100 most influential people of the 20th century. Her talent as a writer, combined with her deep knowledge of the natural world, made her a potent advocate for the use of precaution when working with biological systems. In 1962, her best-selling book, Silent Spring, awoke the environmental consciousness of America with poignant words of caution in the face of rapidly advancing scientific progress. This documentary film pulls insights from a variety of speakers at a 50-year anniversary celebration of Silent Spring. The films are free and open to the public. No tickets or reservations are required. It is part of American Conservation Film Festival and co-sponsored by the Friends of NCTC.